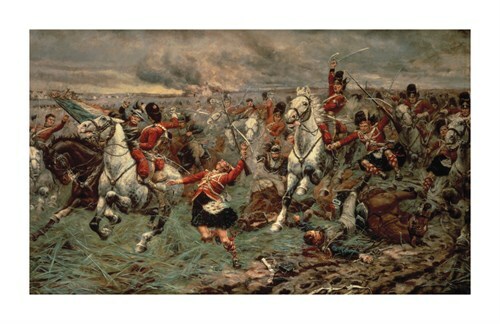 The combined charge of the Royal Scots Greys (then the Royal North British Dragoons) and the 92nd Highlanders (later 2nd Battalion, the Gordon Highlanders) at the Battle of Waterloo has passed into military folklore as one of the most famous single actions of the Napoleonic Wars. While this painting was executed some decades after the event, it depicts an account, widely believed since 1815, which holds that many of the Gordons held on to the Greys’ stirrups in order to engage more quickly with the enemy. Recent research undertaken by the regiments concerned indicates that this report is unlikely to have basis in fact: it would be difficult for a man on foot to hold on to a galloping horse without risking serious injury, and there is no evidence that such feats were attempted. Nonetheless, the combined charge certainly did take place, and was of crucial importance to the outcome of the battle. 300 men of the Gordon Highlanders were confronted by an advancing column of 4,000 French troops. A bleak outcome was averted by the arrival of the Greys, who joined with the Gordons to destroy the French column. Waterloo was to prove the final blow to Napoleon’s imperial ambitions, and must be regarded as one of the most significant military encounters in history. This striking work has long played a part in ensuring that the battle’s legend lives on. Stanley Berkeley was a noted painter and etcher of military subjects. Born in the mid 19th century, he exhibited regularly at the Royal Academy from 1881 and was elected to the Royal Society of Painter-Etchers & Engravers in 1884. During a successful career, he illustrated books and newspapers from his base at Surbiton Hill in Surrey and he married another noted artist, the genre and landscape painter Edith Berkeley. Known today particularly for his colourful, vibrant military paintings, Stanley Berkeley died in 1909.